For us gamers, the soundtracks to our favorite games resonate with us. Some video game songs just spark that nostalgic feeling that makes you just want to go back and play whatever game they came from. Gamers with musical talent will often take it upon themselves to pay tribute to those songs. 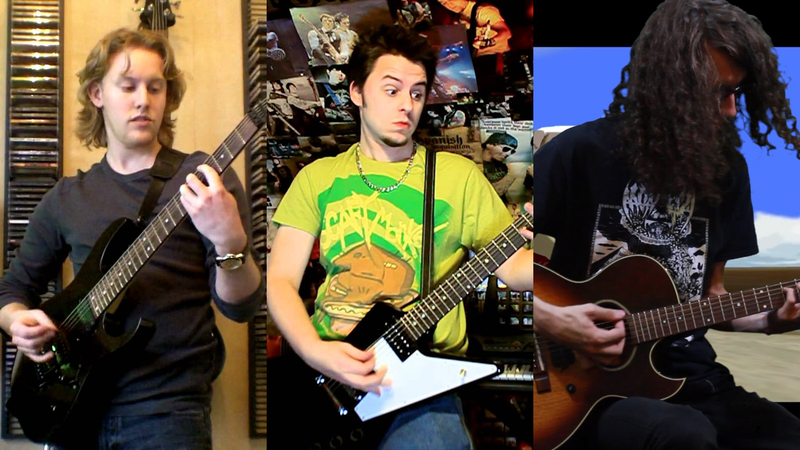 Here, in no particular order, are five individuals who I think make the most rockin’ VGM covers. Matt Graham, known by the handle ArtificalFear, makes awesome metal covers of video game, film, and television songs. Most notably he covers songs from Final Fantasy VII and the entire Zelda franchise. He’s also covered songs from shows such as The Walking Dead and Game of Thrones. He’s been posting videos to his YouTube channel for the past five years. While he doesn’t upload that frequently, his covers are always fantastic. CSGuitar89 is a guitarist from the Netherlands who covers video game songs in a wide range of rock and metal styles from many different franchises, although he tends to cover songs from Zelda more often than anything else. He hasn’t been too active lately, but he’s been uploading videos since 2009, including releasing an album entirely of Zelda covers titled Hymns of Light and Shadow. The thing that really stands out about CSGuitar89 is the amazing production quality of his music. The guitars just sound so sharp and smooth. This guy was definitely one of the first who really got me into VGM covers. RichaadEB is the latest edition to my top five. I recently started listening to his music after I saw him in a collaboration with other YouTube artists. His channel has only been active for a couple years, but in that time he’s produced some fantastic covers. His musicianship is insane. This dude can shred, and he puts out a lot of covers with interesting, progressive metal takes on video game songs. Jack Fliegler, known around the Internet as ToxicxEternity is another guitarist who pulls off amazing metal versions of video game songs. He’s been putting out covers on his YouTube channel since 2008, making him the artist on this list who’s been active the longest. Over those seven years, he’s just gotten better and better. ToxicxEternity regularly puts out well-crafted covers with amazing musicianship and unique arrangements. What really sets him apart is the way he puts unexpected twists on songs, making them feel fresh and exciting. Check out my interview with him from earlier this year here! FamilyJules7x is probably one of the most well-known VGM cover artists. He’s been producing high-quality covers of video game songs for five years now, most of which were arranged in recorded in the time span of one week. For three whole years, Jules uploaded a new cover to his channel every week. Last year, he wrapped up his third and final straight year with “Replay: A Metal Tribute to the History of Video Games,” a seventeen minute medley of iconic video game tracks, which garnered him a ton of public exposure. He’s been kind of quiet since then, only releasing a few covers, but he’s currently gearing up for some new music projects! Check out my interview with him from last year here! That’s it for my list of favorite VGM cover artists! Feel free to share your own down in the comments below! DisturbedShadow is an author for Kotaku’s reader-run blog, TAY, and a fan of video games and heavy metal music. You can can find a full list of his writing here and you can contact him here. You can also follow him on Twitter@DisturbedShad0w.